Get Involved: Share Your Resources! I hope that you are having an enjoyable summer and are able to share some time with your family and friends in these warm months. The PTS Annual Meeting is just 3 months away and there is an incredible amount of daily activity (and email!) in preparation for this event. Successfully operating a trauma center requires the close coordination of a large team of diverse specialist surgeons, physicians, nurses, registrars, and administrative staff. A pediatric trauma center is expected to be prepared to treat a child with a traumatic injury around-the-clock, but this is quite costly. These extraordinary costs are recognized by payers, however, and can be covered through the smart use of the trauma activation fee. The Journal of Trauma and Acute Care Surgery (JTACS) is undergoing some structural changes that have gone into effect as of April 1st. "The association of non-accidental trauma with historical factors, exam findings and diagnostic testing during the initial trauma evaluation"
"Acute Procedural Interventions Following Pediatric Blunt Abdominal Trauma: A Prospective Multicenter Evaluation"
"Focused Assessment with Sonography for Trauma (FAST) in Children Following Blunt Abdominal Trauma: A Multi-Institutional Analysis"
Wurster LA, Thakkar RK, Haley KJ, Wheeler KK, Larson J, Stoner M, Gewirtz Y, Holman T, Buckingham D, Groner JI. The Pediatric Trauma Society approved the Advanced Practice Provider (APP) Committee as an ad hoc committee this year. The goal of the APP Committee is to support and promote the role of Nurse Practitioners and Physician Assistants involved in pediatric trauma care and provide APP perspective to the PTS board and other committees as needed. There are currently 26 members of the committee and growing. Those interested in participation should contact Dana Noffsinger at dana.noffsinger@nationwidechildrens.org. There is a APP Listserv available for members on the PTS website. The committee will provide a lecture regarding the APP role during the preconference and will have its first live committee meeting at the annual PTS conference. The PTS Nursing Leadership Committee is excited to announce several updates from our last meeting in July. 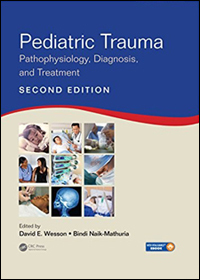 Trauma systems for children, including epidemiology, organization of pediatric trauma care, disaster planning and systems for mass pediatric casualties and community injury prevention programs. General principles of resuscitation and supportive care. Specific injuries commonly seen in children, including from child abuse. Rehabilitation, communication, long-term outcomes and performance improvement methods to monitor outcomes. *Offer cannot be used in conjunction with any other or discount and only applies to books purchased directly via our website. The Education Committee has recently revised and updated both the Clinical Resources and CME/CEU pages located on the PTS website. The clinical resources and CME/CEU links were submitted by a number of our members and are consistently reviewed by the committee to assure relevancy and accuracy. We are opening up a Call for New Clinical Resources, Guidelines and Polices to add to the existing list. Submissions can be emailed to Matilda Wright at matilda.wright@uky.edu. In order to include your resources on the PTS webpage, the submission will need to be blinded so that the hospital or program name is not on the documents. Please include the date on each submission for relevancy. PTS has partnered with the EAST Education Center to provide online pediatric trauma education to our members. PTS members will find a unique coupon code in the members only area that will allow access to EAST Online Education Center. Visit the members only area to retrieve your code. Support the PTS by making a donation to the PTS Education Fund.